Every woman craves for a fresh and glowing face. It not only makes you feel good about yourself but boosts your moral and self-esteem too. But, not all of us are blessed with such skin and this is where makeup plays an important role. Concealer in particular is a must have product for me. I don’t like to layer my skin with foundation especially in these humid days. Concealers that match your skin tone are much forgiving than sliding foundation. These days you can get a lot of variety in the market as far as this product goes. Depending upon your budget you can opt for the real high end ones or the more affordable drugstore formulas. Like foundations, concealers come in a variety of textures that are targeted to suit variety of skin types. If you want to try out one then mentioned below are few really good concealer that are available in the Indian market today. • Estee Lauder Double Wear Stay-in-Place Flawless Wear Concealer: Oooff.. quite a mouthful. It is the best concealer that I have tried so far. Has a lightweight creme formula that blends like a dream and if that is not enough it is OIL FREE and WATER RESISTANT as well. To add to it Double Wear has TRANSFER-RESISTANT formula that provides medium buildable coverage that lasts all day long. Despite being a longwearing concealer this product does not have a dry feeling nor does it crease. Creates the perfected look of flawless skin all day. This concealer is available in 10 different shades. • Clarins Instant Light Perfecting Touch: It comes in an easy pen applicator form, which is easier to travel with as well. This product comes in five different shades including one for darker skin tones. It has a creamy formula that blends well and stays on for a long time. Clarins Instant Light Perfecting Touch hides imperfections and all signs of fatigue effectively. Apart from using it as a concealer you can double it up as a highlighter to illuminate your cheekbones, brow bone, forehead and chin. The make-up must-have for a flawless complexion. Not recommended for people with dark under eye circles. • Make up For ever Full Coverage Concealer: It a full coverage concealer in true sense, it hides everything it touches. A perfect product for concealing the most extreme flaws, such as scars, severe skin damage, beauty spots, depigmentation or birthmarks. It is a matte finish concealer with ultra long-lasting staying power and waterproof formula. This product is available in 12 shades. • L’Oreal Paris True match concealer: It is a light weight concealer which provides light to medium coverage. Blends well and does not give a cakey appearance. It does not have a super long staying power like the ones mentioned above. People with oily skin might have to reapply it couple of times throughout the day. A good budget friendly product to hide minor imperfections on the face. 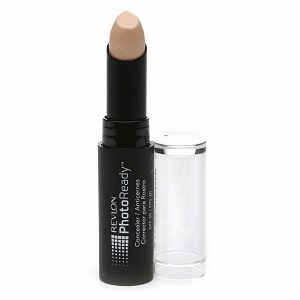 • Revlon PhotoReady Stick Concealer: it is another good option for all those who want effective budget friendly product. It is an oil-free and fragrance-free product which might interest people with sensitive skin types. There are six shades in the line ranging from fair to deep. People with dry under eye area may notice it getting a little cakey under the eyes. Moisturise well and you can avoid this problem. hi Era nice idea to review concealers.I have been using L’oreal for under eye area and its quite good.u feel fresh and raring to go but i thought the Estee Lauder looked really good too from your review. shilpa for daily use try colorbar stick concealer..its super awesome! have you tried all of them Era? could you include the price as well. i know estee lauder will be expensive. revlon will be affordable however i dint like their photo ready pressed powder. How about kryolan?.. I am going to kryolan counter tomorrow,what are the must buy products?.I need a concealer/foundation and compact.Any suggestions please? I would like to add the maybelline dream lumi touch ones recently introduced..I am loving it..
MAC prolongwear has been my best and I have tried many cos i have really bad circles. sorry not in the list though :(. would love to try EL and MUFE.. I love MAC studio finish!!! it’s my HG concealer. MUFE seems to be great I am sure it would be very pricey.. but its ok as long as it works great..